Shima Potholes (四万温泉の甌穴群, shima ouketsugun) are located on the south side of Shima Onsen. 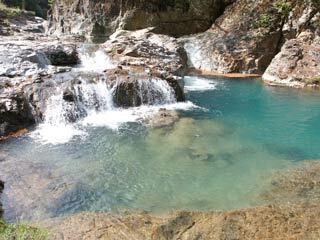 They are designated as a Natural Monument of Gunma Prefecture. There are 8 holes which were created by the water of the Shima River over a period of 10,000 years. One of potholes is 2m wide and 4m deep. Caution: When you hear the buzzer, the Shimagawa Dam will release its water. So, evacuate to high ground as soon as possible. 1. use local bus to Shima Onsen.